"Oh don't worry, that's just one of his little quirks." Hello there Tropers! 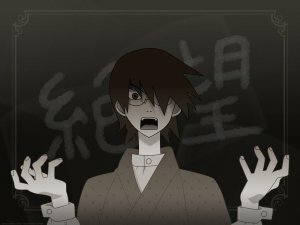 This is Kafuka Fuura, here to describe the wonderful little show we call Sayonara, Zetsubou-Sensei. SZS is a delightful Slice of Life comedy series which recaps my highschool days. The show has a fairly upbeat and silly tone. It started off as a manga drawn by the delightful Mr. Koji Kumeta and was later animated by Studio Shaft, who of course put their own unique and creative touch on it. Chiri Kitsu: An intelligent and hard-working girl and my closest friend. Seems to really like shovels. Matoi Tsunetsuki: A loyal girl who's very good friends with everyone and will never abandon or desert anyone. It's just Deep Love! Abiru Kobushi: Animal lover extraordinaire. Said to be a victim of Abusive Parents, but that's silly! Nobody here could possibly be suffering in a wholesome show like this! Kiri Komori: Our resident Zashiki-warashi! Nami Hito: Just an average girl. Kaere Kimura: A foreigner with Dissociative Identity Disorder, which is like whether or not you put soy sauce or ketchup on ramen. Meru Otonashi: She's a bit of a shy girl who prefers to talk mainly via texting, but her voice is really the Most Wonderful Sound. Taro Maria Sekiutsu: Another foreigner, who came to Japan through perfectly legal means. Hit our Prime Minister on the head once. Kagero Usui: Our resident fairy. Nozomu Itoshiki: Our wonderful Wacky Homeroom teacher! Is a bit odd in his habits, but that's alright, we all love him anyway! So there you have it! Please enjoy! ...What, you're saying that Sayonara, Zetsubou-Sensei is a dark, morbid and surrealist social satire with a cast of psychotic stereotypes? That's ridiculous! How could a show like that exist so close to me?! I'll just have to make it all better.